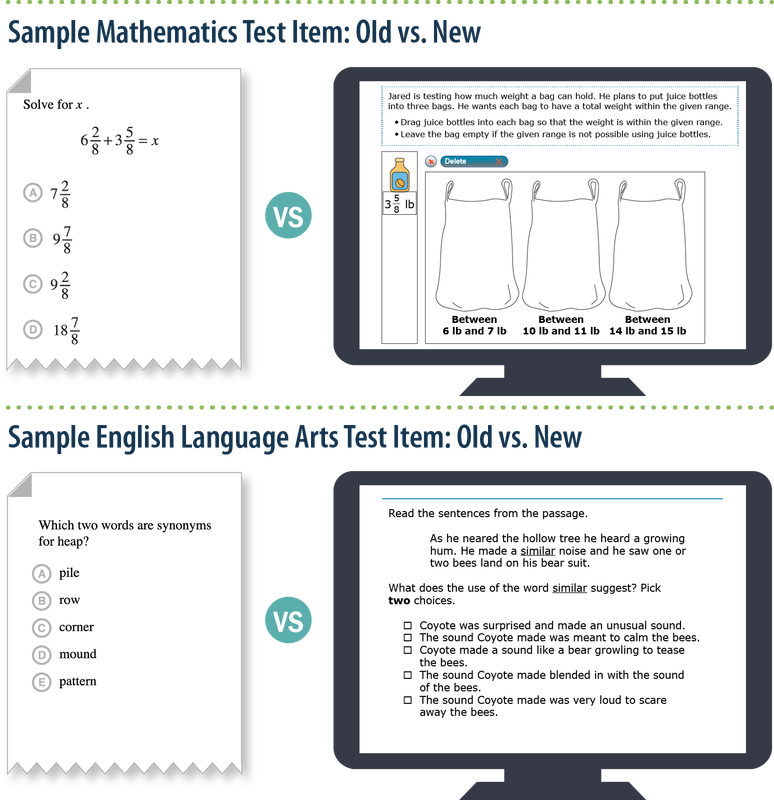 The CAASPP System includes computer-based assessments that are aligned with the Common Core State Standards (CCSS). Aligned with the CCSS for English-language arts/Literacy and mathematics, for students in grades 3-8 and grade 11. The CDE is developing a new science assessment, for students in grades 5-8 and once in high school. EAP is a program that assesses students for college-readiness in grade 11 of high school. Each spring, all grade eleven students in California take the Smarter Balanced Summative Assessments for English language arts/literacy (ELA) and mathematics. These assessments, which are administered as part of the CAASPP System, also serve as an indicator of readiness for college-level coursework in English and mathematics and are used by the California State University (CSU) and participating California Community Colleges (CCCs) to determine EAP status. A report that shows how students in grades 3-11 scored on the CAASPP assessments for English language arts/literacy and mathematics. ﻿NEW CAASPP Assessment Student Score Reports﻿ will be mailed home in the very near future. Here are two Guides to assist you with understanding the score report. We have one in English and one in Spanish. There are also Guides available in 9 other languages on the CDE website. Now posted on the California Department of Education (CDE) Web site is the video Understanding Your 2016–17 Student Score Report. Approximately five-minutes in length, this video is an excellent resource for parents and students to help them better understand the 2016–17 Student Score Report, which details the student’s standardized testing results. Milpitas Unified School District students are on the path! The State of California worked with other states, educators, business leaders, and colleges to define the skills needed for students to graduate college and be career-ready. Along with other states, we have shifted our focus to teaching these higher thinking skills, and regularly check progress to ensure our students are moving toward their learning goals. Now, with the new assessments that measure growth over time, we will have the information we need to adjust teaching and improve learning, increasing each student’s opportunity to succeed. Expectations are higher and deeper – students are asked to explain reasoning, support arguments with evidence from texts, and persevere in solving real world problems. Students are evaluated to ensure they are making progress – students and teachers review work to check understanding and revise teaching and learning where weaknesses are identified. Rapid response when challenges are identified – with good information teachers can course correct before students fall off track. STAR testing has been replaced by the California Assessment of Student Performance and Progress (CAASPP). The tests are interactive, challenging and uniquely accessible with questions that require higher level thinking skills, look like real life problems, and are similar to expected classroom work. Most important, it provides information that informs action in the classroom.